White Peacocks (Anartia jatrophae) are true brush-foot butterflies. They are found throughout peninsula Florida in open areas near water. During the cooler months they are found only in south Florida. They sip flower nectar and are attracted to Spanish needles in particular. 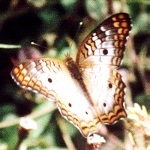 Adult butterflies have a wingspan of 2-2.3". They are darker in the summer. White hyssop, matchheads, and wild petunias serve as hostplants. Pale yellow eggs are laid singly near the hostplant or on the underside of the hostplant's leaves. The caterpillars are black with silver or white dots and many spines. The chrysalis is light green with small black dots. More photos of White Peacocks are in the Photo Gallery.